Each workshop will include interactive exhibits and several exercises where you can share your ideas. Tell us what you want to see along the River and Tributaries, the things you would like to do, and how the River can continue to be a community asset. The workshops will be family friendly and everyone is welcome! Refreshments & snacks will be provided! River Rover making a special appearance! Chapter 341 of the Statues of 2017, also known as Assembly Bill 466 (AB 466), established, within the Santa Monica Mountains Conservancy, the Upper Los Angeles River and Tributaries Working Group. 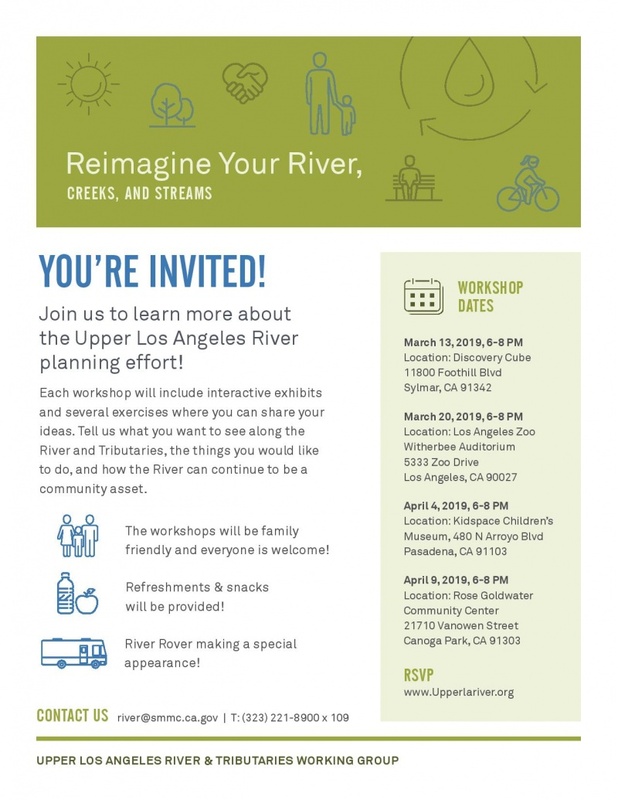 The Working Group is charged with developing a revitalization plan for the Upper Los Angeles River, the tributaries of the Pacoima Wash, Tujunga Wash, and Verdugo Wash and any additional tributary waterway that the working group determines to be necessary. In accordance with AB 466, Working Group members shall prioritize planning efforts that represent disadvantaged communities, while developing a revitalization plan that addresses the unique and diverse needs of these waterways and the communities through which they pass, including a master planning process with community engagement and outreach to disadvantaged communities, identified pursuant to Section 39711 of the Health and Safety Code.